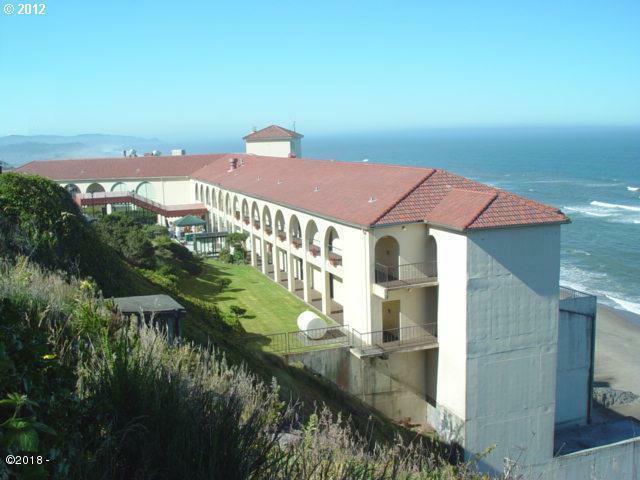 Oceanfront studio, Room 139, at The Inn at Spanish Head Resort Hotel in Lincoln City features awesome views & easy access to miles of sand & surf. Beautifully updated with attention to detail including crown moldings, recessed lighting, fresh paint, luxury-vinyl flooring, new doors and new draperies. Kitchen & bath feature granite counters & refaced cabinets. All new furnishings including king-size bed, sofa-sleeper, Ultra-Hi-Def 55'' TV with blue-ray player and night stands equipped with USB ports. You can choose to contract with the Inn to manage as a nightly rental when you're away or opt to enjoy for personal use only. Full-service amenities include the award-winning ''Fathoms'' Restaurant/Lounge, beachside pool, saunas, on-site managers, meeting rooms, valet parking and more!